Theo Asseler was born in Aarlanderveen on the 12th of March 1823. He worked as a construction worker, later as a carpenter, and was employed by his uncle, the architect Th. Molkenboer, as an overseer. 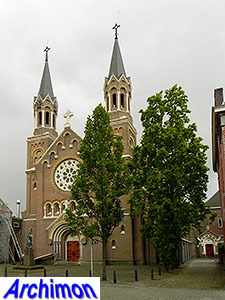 In this position he was involved in the construction of the Redemptorist church in Amsterdam, one of the first new churches in the Netherlands in which Gothic style and proportions were succesfully applied. Asseler was probably educated by his uncle in architectural skills and built his first own designs, a school in Amsterdam in 1862 and a presbytery in Medemblik in 1863. Although he lived in Amsterdam, he also still worked as an overseer for his uncle in Leiden. When Molkenboer died in December 1863, Asseler did not succeed him and became a self-employed architect instead. During Asseler's short career as an architect he used a variety of styles, often showing similarities with the work of his uncle. 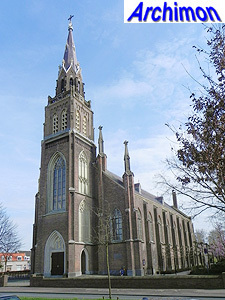 In 1864 he extended an older neo-Classical church in Haarlemmerliede with a matching new front with turret. 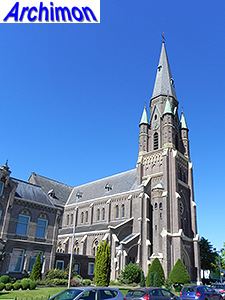 In 1866 and 1867 he built new churches in that style in Bergen and Boskoop. In the same period he designed several churches in an early neo-Gothic style, much like his uncle's. 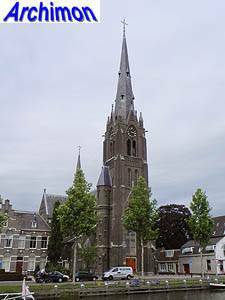 The first of these was probably the church in Voorschoten, a replacement for one of Molkenboer's churches. However, for most of his career he designed churches in neo-Romanesque style, with only a few in neo-Gothic style. Of his ca. 70 designs, more than 20 were churches and chapels. Several of these have been demolished since. Asseler died in Amsterdam on December the 27th 1879, after a short illness. At that moment he was at the height of his career. Several of his assignments were completed by A.C. Bleijs. The following is a list of Asseler's religious work. It is possibly incomplete. Enlargement of an aisleless church in neo-Classical style with a new front in the same style. Church in neo-Classical style. Demolished in 1923. Church in neo-Gothic style. Tower added in 1887 by E.J. Margry. Church in neo-Classical style. Demolished in 1974. Church in neo-Gothic style. Demolished in 1969. New facade with tower, in neo-Classical /neo-Romanesque style. No further details. Replaced by current church O.L. Vrouw van Altijddurende Bijstand. Church in neo-Romanesque style. Demolished in 1985. Aisleless church in neo-Romanesque style. Church in neo-Classical style with neo-Romanesque details. Church in neo-Romanesque style. Gradually replaced after 1929. Basilica in neo-Romanesque style, with front with double towers. Part of a Redemptorist monastery. Enlarged in 1907-1909. Basilica in neo-Romanesque style. Extended with a transept, crossing tower and new choir in 1906. Demolished in 1966. Aisleless church in neo-Romanesque style. Demolished in 1971. Big three-aisled cruciform basilica in neo-Gothic style. Big three-aisled cruciform basilica in neo-Gothic style. Tower only partly completed according to Asseler's design; the upper part was built in 1900, from a design by A.A.M. Bruning. In 2016 part of the tower collapsed due to fire. Cruciform, aisleless church in neo-Romanesque style, with front with double towers. Aisleless chapel in neo-Romanesque style. New front added by A.J. Kropholler in 1908-1910. 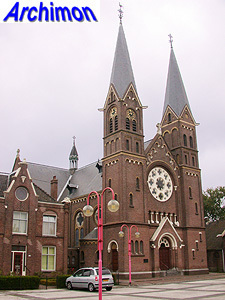 Aisleless church in neo-Gothic style, but with front and tower with neo-Romanesque details. Completed by A.C. Bleijs. 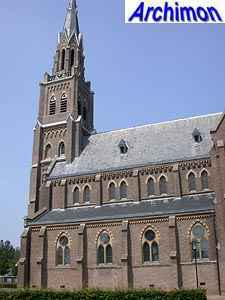 Neo-Gothic chapel for an abbey, part of which was also designed by Asseler and built in 1869-1870. Completed by A.C. Bleijs. Incorporated in the present abbey church, built in 1927 from a design by H.W. Valk.